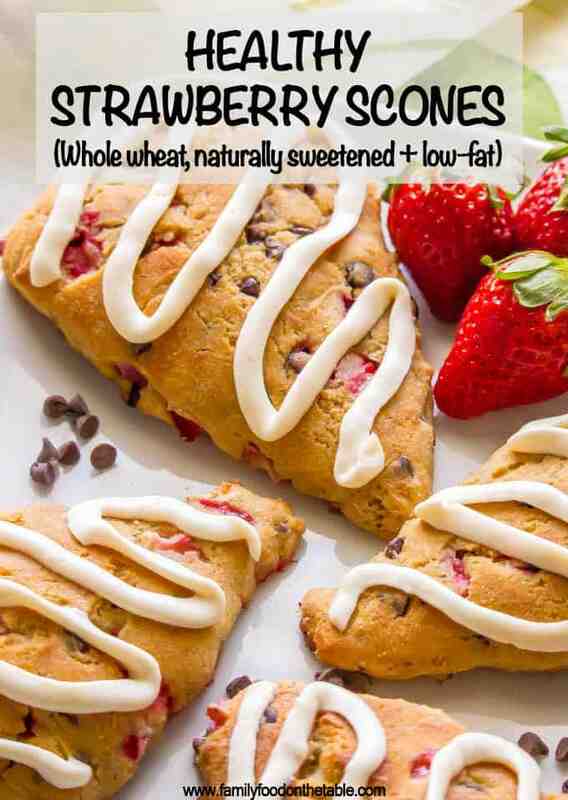 These healthy strawberry scones are whole wheat, naturally sweetened, low in fat and perfect for breakfast or brunch! You can add in some optional mini chocolate chips and/or serve with any of my glaze topping ideas for an extra special treat! Anyone else watch the season premiere of Westworld this past Sunday? We started it that night and then rewatched and finished it on Monday. Sadly, that’s pretty much been the highlight of the week so far. 😂 It’s felt like a long, slow one but I will say I’ve been doing a good job of getting to bed at a decent hour and that’s felt great. And tonight we have M’s 1st grade Bugz show to look forward to at school. She’s been practicing a lot and I can’t wait to watch! Cause it’s spring and there’s all kinds of occasions for brunch. 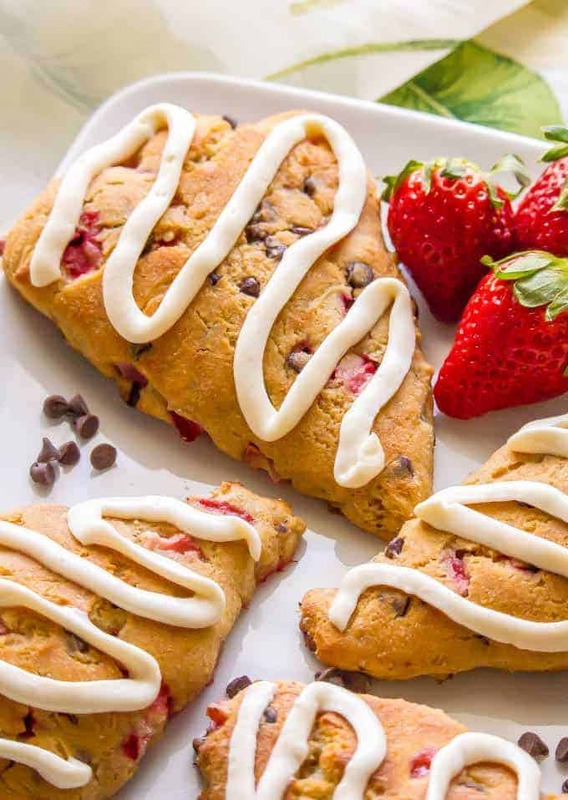 And these healthy strawberry scones will surely be a hit at any party or special weekend feast! 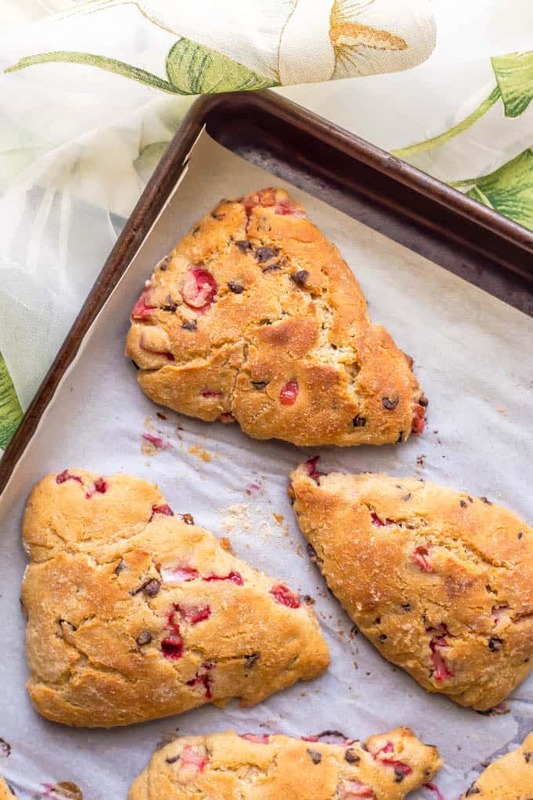 These scones are whole wheat, naturally sweetened, low in fat and I’ve got ALL KINDS of fun ideas for ways to make them even more special and delicious. And if you’ve never made scones before, I promise it’s really easy. You just mix up the dough, dump it onto a really well floured service, use your hands to pat it into shape and cut the scones out. No bread machines or kneading or anything fancy here. I use white wheat flour in my baking, but you can substitute whole wheat flour or all-purpose flour if you prefer. I use skim milk but you could certainly substitute another milk. It helps to dice the strawberries pretty small so that you get a more even distribution throughout the batter. 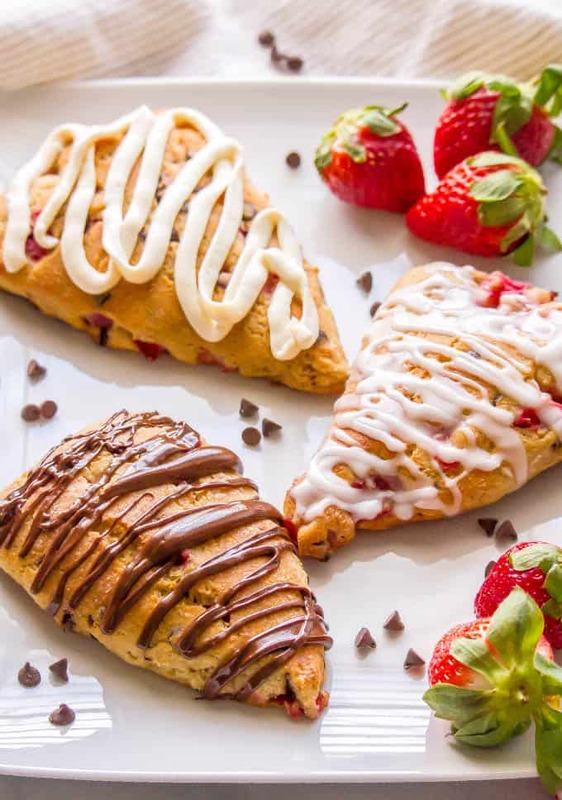 Refrigerating the dough helps to prevent the scones from spreading out as much as they bake, so they retain their triangle shape. You can certainly skip this step if you aren’t worried so much about the way they look. 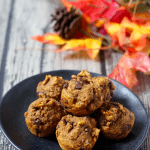 The mini chocolate chips are optional but a fun add-in! 1. A cream cheese glaze. This might be my favorite because strawberries + cream is such a good combo. 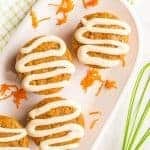 My cream cheese glaze is naturally sweetened and uses no butter so it’s still a lightened up option. I included the recipe in the notes section of the recipe card below. 2. A lemon glaze. 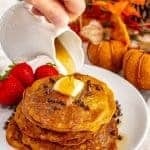 This is a traditional powdered sugar type of glaze to drizzle over the tops of these. Feels very fresh and light. I included the recipe in the notes of the recipe card below. 3. Drizzle some chocolate on top! 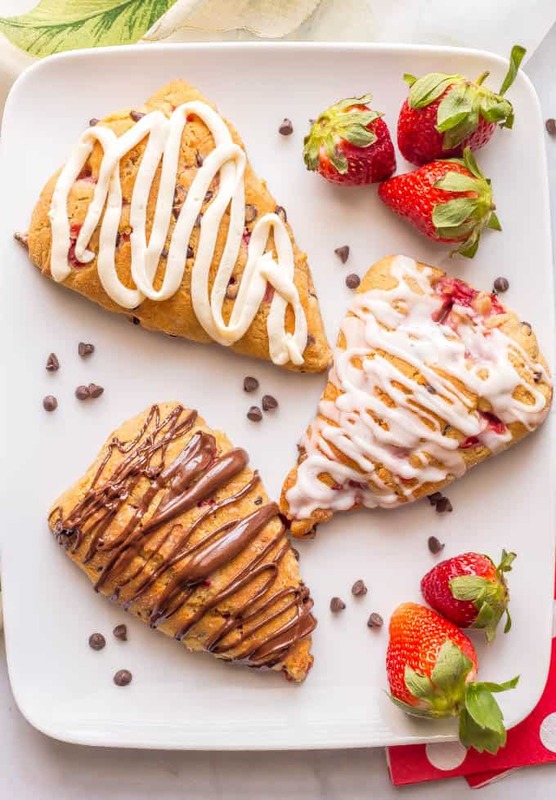 You can either melt some chocolate chips in the microwave and drizzle it over the top of each scone or use a store-bought or homemade chocolate sauce. 4. Finally, if you want to keep it simple but add a little extra sweetness, you can sprinkle some granulated sugar on top of the scones before they bake. A coarse brown sugar is especially delicious but any kind will do. 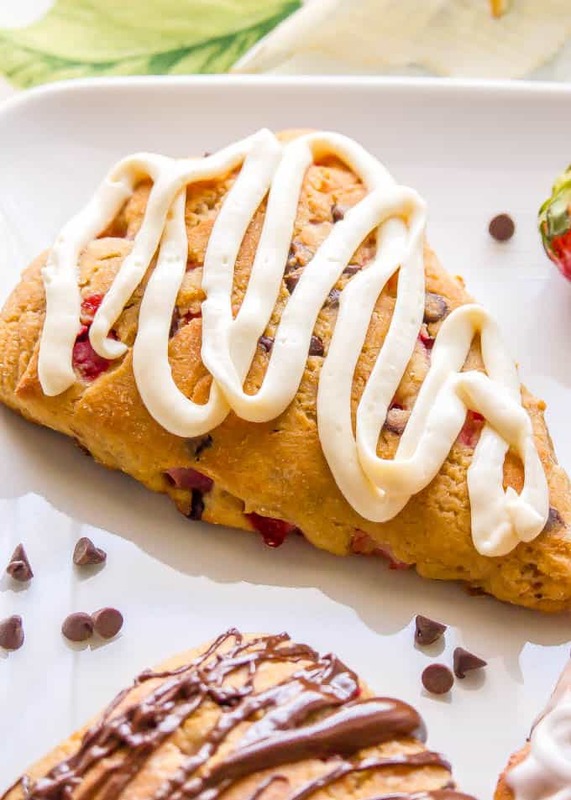 There’s just so many ways to make and serve these whole wheat strawberry scones! 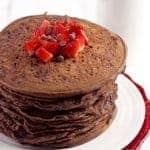 I hope you give them a try for your next brunch gathering or special weekend breakfast. 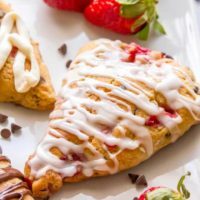 These healthy strawberry scones are whole wheat, naturally sweetened and perfect for breakfast or brunch! Using a pastry cutter or two knives, cut in the butter until the mixture resembles small peas. In a separate bowl, whisk together the milk, maple syrup, yogurt and vanilla until smooth. Add the wet ingredients to the bowl with the dry ingredients and stir until just combined. 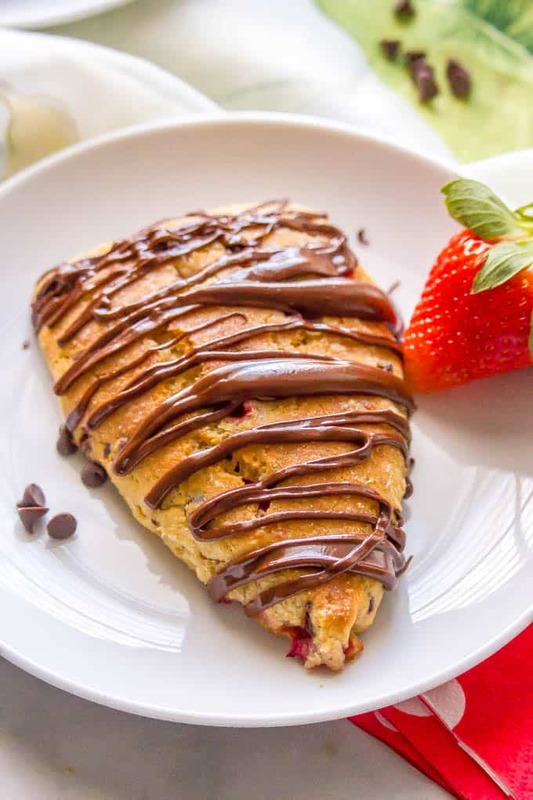 Fold in the strawberries and chocolate chips, if using. Turn the dough out onto a very well floured surface. Sprinkle the top of the dough with extra flour and shape into an 8-inch round disk (about an inch thick), using extra flour as needed to prevent sticking. Cut into 8 equal triangles and transfer to the prepared baking sheet. Brush each scone with melted butter and sprinkle with sugar, if desired. Bake at 425 for 16-18 minutes, until golden brown. Serve warm with any desired glazes or toppings (see notes below). For a cream cheese glaze: Combine 4 oz. reduced fat cream cheese (softened) with 2 tablespoons plain non-fat Greek yogurt, 2 tablespoons maple syrup and 1/2 teaspoon vanilla extract. Stir well to combine, adding up to an extra tablespoon of maple syrup as needed for consistency and sweetness. 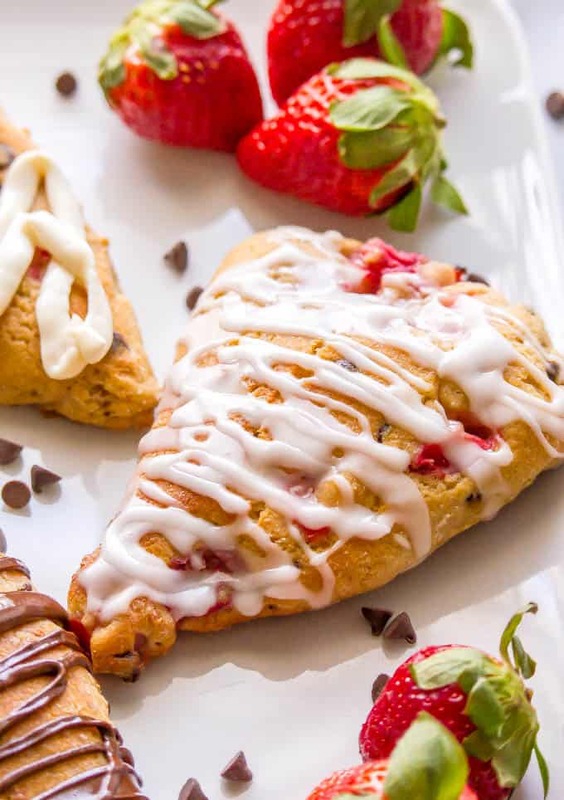 Drizzle over baked scones. Another option for a topping, instead of the cream cheese or lemon glaze, would be a drizzle of chocolate. You can either melt some chocolate in the microwave or use a homemade or store-bought chocolate sauce. 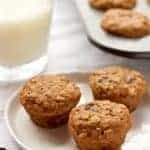 Or if you don’t want to top these with a glaze, but you do want to add a little extra sweetness, you can sprinkle the tops of the scones with a bit of sugar before baking - about a tablespoon or so total. I prefer a coarse brown sugar, but any kind will do. 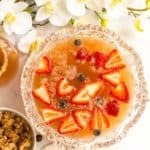 Can I use honey or agave nectar in place of the maple syrup? Hi Laura! Yes, I think either of those would work in place of the maple syrup. Hope you enjoy them!